As puzzle games are one of my favorite video game genres, I am always on the lookout for new and unique puzzle games. This lead me to today’s game The Gardens Between created by The Voxel Agents. The idea of a time manipulation puzzle game by itself is not that original as there have been quite a few other puzzle games that have utilized time manipulation. What intrigued me about The Gardens Between was how it utilized the idea. In addition to altering the environment, you use the time manipulation to control the characters themselves. Combined with an interesting story and great visuals, I was really excited to try out The Gardens Between. The Gardens Between is a puzzle game with innovative ideas and great puzzle design that could have been a classic puzzle game if it wasn’t so short and easy. We at Geeky Hobbies would like to thank The Voxel Agents for the review copy of The Gardens Between used for this review. Other than receiving a free copy of the game to review, we at Geeky Hobbies received no other compensation for this review. Receiving the review copy for free had no impact on the content of this review or the final score. In The Gardens Between you play as best friends Arina and Frendt. One night they are hanging out in their tree house when it is stuck by lightning. This results in them being transported to a dreamlike world full of strange looking islands. Each island is constructed of items based on memories from their friendship. The pair must work together to explore these islands while reliving their memories in order to make it to the top of each island and make it back home. At its core The Gardens Between is a story driven puzzle game. The premise of the game is that you begin each level at the bottom of the island and have to make your way to the top. This sounds straightforward but things are not as simple as they first appear. In The Gardens Between you don’t directly control either of the characters. Instead you control time itself. Push the analog stick right/press a button and you can make time move forward. Press left on the analog stick/press a button and you can rewind time. You need to use this mechanic of rewinding/progressing time to manipulate the characters and environment in order solve all of the puzzles in the game. In addition to the time manipulation mechanics you control a magic lantern that holds glowing orbs. When the magic lantern gets near a glowing orb it picks it up. These orbs are important as they are used to control magical switches which allow you to progress to the next part of the level and finish each level. There are obstacles throughout each level which take away the glowing orbs so you will need to pull levers and use the time manipulation mechanics to get the lantern and glowing orbs past these obstacles. I have played quite a few indie puzzle games and I have to say that The Gardens Between is unlike anything that I have ever played before. There have been quite a few games that have used time manipulation mechanics before but none of them use them quite like The Gardens Between. In most of these other games you use time manipulation to manipulate the environment while still retaining control over your character. In the Gardens Between the time manipulation mechanics control both the environment and your characters. This creates a really interesting experience as you have to think about how rewinding and progressing time will impact both the environment and the characters. In some ways it kind of feels like you are playing with the remote for a VCR/DVD player. I will admit that I was a little skeptical of the mechanic at first as the first couple of puzzles don’t do anything highly unique with the mechanic. I quickly saw how well the mechanic worked and how innovative it was though mostly due to two factors. First the mechanic is actually really simple. There are literally only three buttons/actions that you use in the entire game. You can progress time, reverse time, and interact with objects. That is it. This might not sound like much but the game comes up with some really clever ways of using these three actions. With there only being three mechanics it is really easy to jump right in and play as the game doesn’t have to waste a bunch of time teaching you mechanics. The game occasionally introduces you to new ways to use the mechanics but it is done through puzzle concepts that you will have to use later in the game. The game’s simplicity means that everyone can play the game as you can take the game at whatever pace you prefer. This makes sense as the game is meant to be a relaxing game where you can take your time solving the puzzles. The other reason why the time manipulating mechanic works is that the developers find plenty of ways of utilizing the mechanic to create really clever puzzles. The puzzle design is intricately intertwined with the theme of each world which allows the game to have some really clever puzzles. The puzzle design is what really makes the game in my opinion. While it is kind of debatable how difficult the puzzles are, I find it hard not to admire the creativity that was put into designing them. To illustrate my point I want to quickly talk about two of the puzzles in the game. I would gladly talk about more of the puzzles but I want to let you discover them for yourself. First I want to begin with a puzzle that involves a computer. In this island you need to use the time manipulation mechanics in order to get the characters to type different commands into the computer. By moving time backwards and forwards you are able to input commands into the computer which give you access to objects that you need to complete the rest of the level. The other island I want to point out features a large dinosaur skeleton. As you progress time you discover that the dinosaur skeleton is starting to fall apart. This island forces you to manipulate time so you can use different parts of the skeleton to reach different parts of the level. These are just two examples of how the game does a great job using the setting of the islands to create unique ways of using the time manipulation mechanic. As I mentioned earlier The Gardens Between is a story driven puzzle game. While the puzzle design is what drives the game, I don’t think the story should be ignored. The basic story of The Gardens Between is the story of childhood memories and friendship. The story of The Gardens Between is not up front and center but told in a more subtle way through the islands themselves. The story is quite good and is complimented with great visuals and soundtrack. Most people are going to be attracted to the game because of the time manipulation mechanics but the story is also something that you should check out. There is a lot that I loved about The Gardens Between. The Gardens Between had all of the makings of one of the most innovative and better indie puzzle games that I have played in a while. If I were to stop the review right now it would have received a score either a half or a full star higher then it ended up getting. Unfortunately the game has two issues which keep it from being as good as it could have been. The biggest problem with the game is the length. The game includes around 20 different islands/levels which is not bad. The problem is that each level on average only takes around ten minutes to beat with some levels taking even less time. This results in the game only taking around two to three hours to complete. Those two to three hours are great but they end far too quickly. I really enjoyed my time with the game but it seemed to end almost as soon as it began. It is a shame that the game is so short because it could have been an amazing game if it would have been a little longer. The other problem that I had with the game is that the puzzles aren’t very challenging. Maybe it is just because I play so many puzzle games but I can’t say that I was that challenged by The Gardens Between. There were only a couple puzzles that took me more than a couple minutes to solve. As I mentioned earlier the puzzle design is really clever but it is not difficult. Once you get a hang of the mechanic of going backward and forward in time, it is usually pretty easy to figure out what you need to do. One of the reasons why the puzzles are pretty easy is that the game regularly limits how much of the world you can explore at a time. This makes the puzzle solving kind of easy as there are a limited number of things you can do in your current section of the island. This allows you to look more closely at your options which makes it pretty easy to figure out what you need to do. 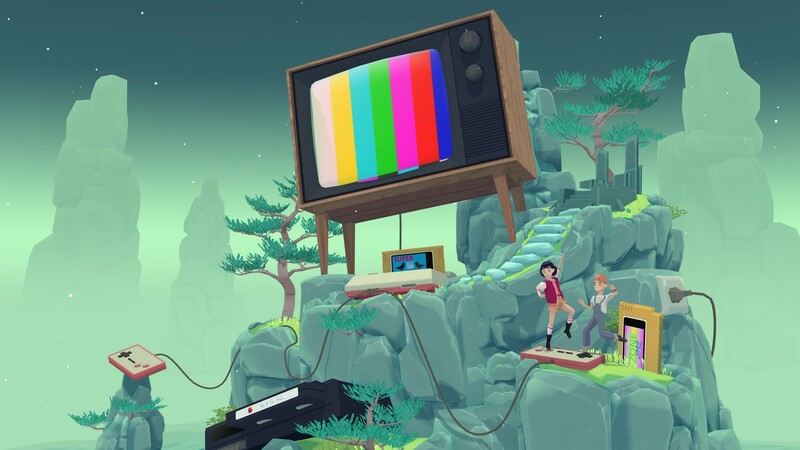 The Gardens Between is an interesting game as it has so much going for it. The time manipulation mechanic is truly original and unlike anything I have ever seen before. The mechanics are really simple and to the point which allows you to spend most of your time solving the puzzles instead of figuring out what you are doing. The designers also did such a great job finding unique ways to utilize the mechanic in different and interesting ways. The puzzle design in the game is great. The Gardens Between had all the makings of a fantastic game and yet has two problems that have a significant impact on the game. The first problem is that the game is really short. You can beat the entire game within 2-3 hours which is a shame as it ends right when the game is really picking up. The other problem is that the puzzles are on the easy side where they won’t really challenge you. If it were not for these two problems I could easily have seen giving the game four or four and a half stars. The Gardens Between is still a great game but these issues keep it from reaching the next level. If you generally don’t like puzzle games or aren’t a big fan of the time manipulation mechanic, The Gardens Between may not be for you. Otherwise I would highly recommend picking up the game. Whether you should pick up the game for full price or wait for a sale depends on how much the game’s short length bothers you. A truly original puzzle game experience. Great visuals, story and atmosphere. Really short as it is only 2-3 hours long. The puzzles are on the easy side.